This issue begins the story that has been culminating for eight issues. It's going to be a pretty epic story, and this was an interesting issue, despite not having much going on here. I found myself very quickly moving through this issue. I attribute this to the very frequent double-page spreads and splash pages, some of which I felt were unnecessary. I love Bryan Hitch's art but this is a tactic that Robert Venditti has used in his GREEN LANTERN work since Rebirth began. He has an end-goal in mind for each issue, and not much will happen in the meantime. This means that he'll use a lot of action splash pages without much dialogue or plot in order to get the page count up. I've read A LOT of Venditti comics. I'm an expert. He's done this before and it's plain to see here. It's not exactly nefarious or terrible on his part, but I think it's a misuse of the monthly format. It's plain to see where this story would go based on the cover of this issue; the Deathbringers are here, and Hawkman has to stop them. What happens at the end of the issue? 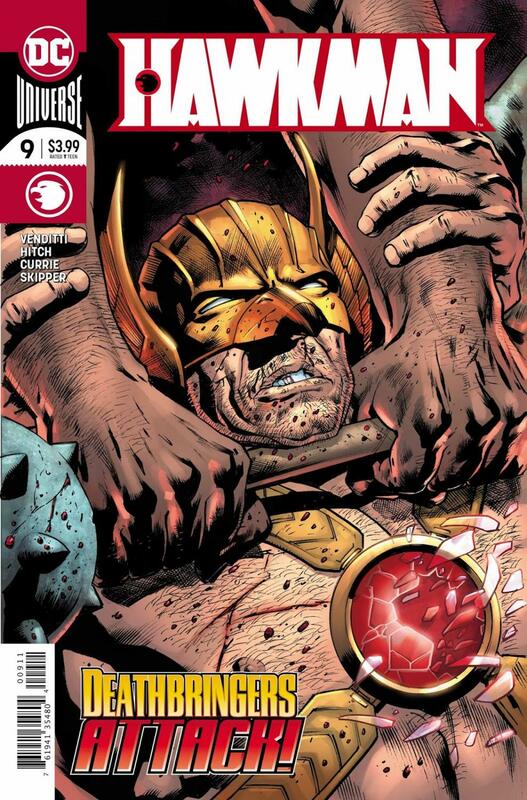 The Deathbringers are here, and Hawkman has to stop them. Aside from a character reintroduction later in the issue there isn't much here in terms of plot and that's inherently disappointing. Hitch is still doing fantastic work, though. The splash pages are so wonderful and the double-page spreads in particular are very well-handled. He and the rest of the artistic creative team of Andrew Currie and Jeremiah Skipper, along with letterers Richard Starkings and Comicraft, have reached a collaborative peak where they simply out-do themselves with each passing issue. Skipper provides just the right palette to Hitch's work, and while I love Currie's inking, I feel like Hitch's art improves whenever he inks himself. He reaches the quality and detail that he wants and it all comes together very tightly. As I said before, there isn't much in the way of story. I came up with a term to describe the Venditti process as detailed above when I was reviewing his HAL JORDAN AND THE GREEN LANTERN CORPS; page space economy. It's something that he doesn't do very well and you can tell when Venditti either has nothing to say or wants to pad out an issue, and that's when he includes splash pages galore.